Join Ebony, owner of YogaAnd, for Hip Hop yoga, a fusion of yoga and dance. 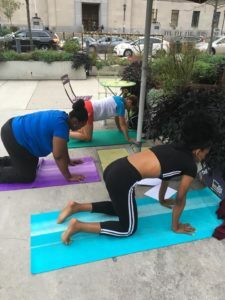 Hip Hop Yoga is a physical yoga practice with an unorthodox sequence that includes your favorite asanas, combined with feel-good dance moves. You are encouraged to bust out singing when your favorite song blasts through the speaker, as it is truly a judgment free zone intended for you to release.